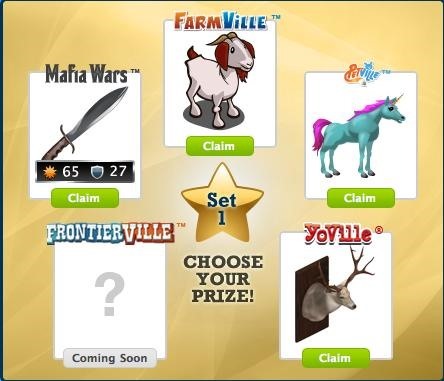 Zynga games has released their ZLotto feature that you can use to get exclusive prizes for FarmVille, Mafia Wars, YoVille, PetVille, and FrontierVille! In this guide I will discuss all the aspects of this feature, how to use it, and some tips for success. 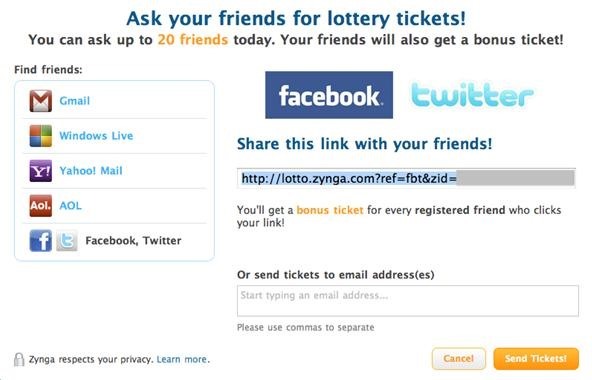 Go to http://lotto.zynga.com/ and set up an account if you haven't already. 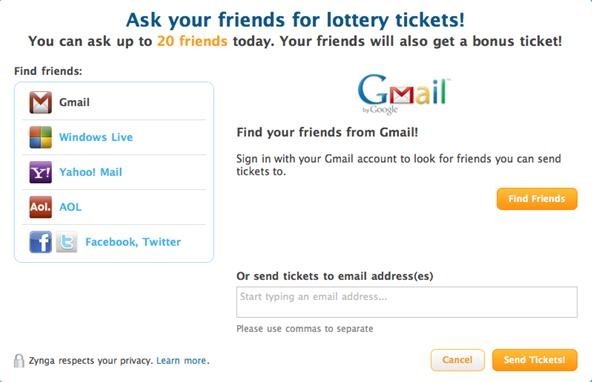 If you don't know all your friends email addresses you can still play this! In fact you can get tickets faster by getting your Facebook link. On the left side select Facebook, Twitter and you will get a code that you can post on your wall. You can also SEND tickets from this page until you reach 20 and your friends can return the ticket when they get it in their email. 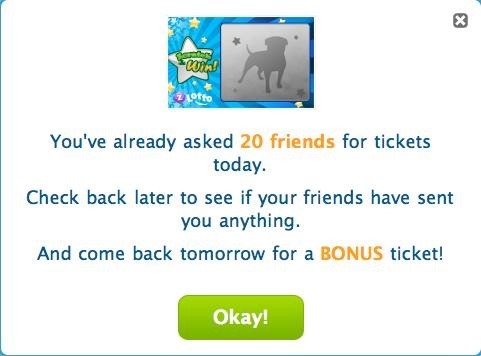 After a few minutes you can refresh your Lotto page to see if anyone has sent you tickets. Your friends will probably comment on or like your Facebook post when they have sent them so you will know to check. 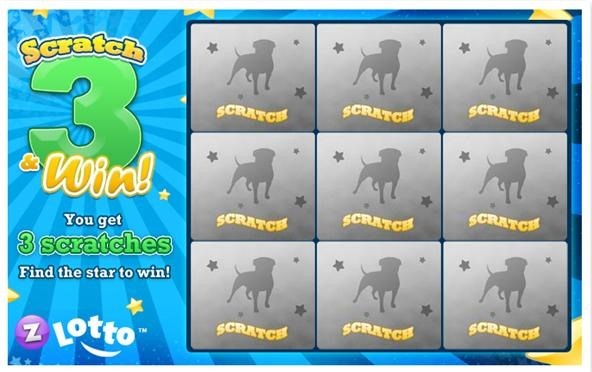 Once you have tickets you can play the scratch card. When you click play, a scratcher board pops up and you can click on up to 3 spaces to try to find a star. There is one star per board and it will be either set 1, set 2, set 3, or set 4. If you get the star you can claim your prize! Upon clicking claim you will get a popup that has the claim code at the bottom. 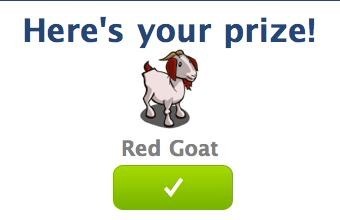 Copy that code (just in case) then click the green button to collect your prize! You will be taken to the game's application page where you will see your code filled in. Click Claim Item! 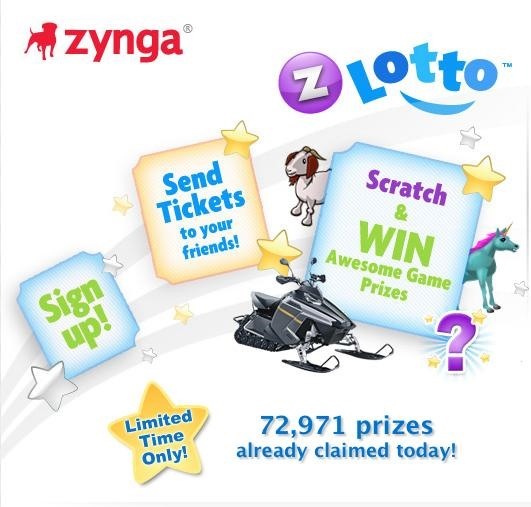 Your game will load and the popup will tell you that you've collected an item from Zynga Lotto. 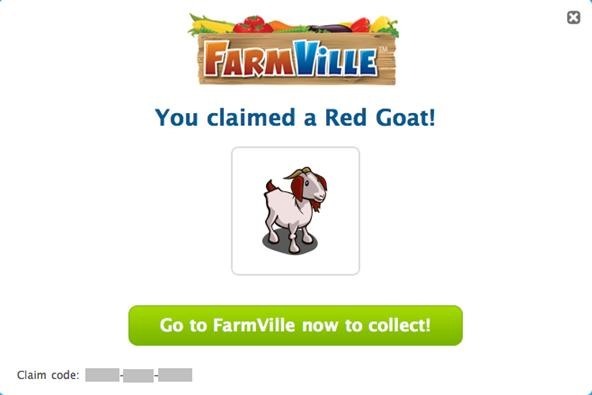 Here is my FarmVille Red Goat in my gift box. And here is the red goat on my farm with his friends. 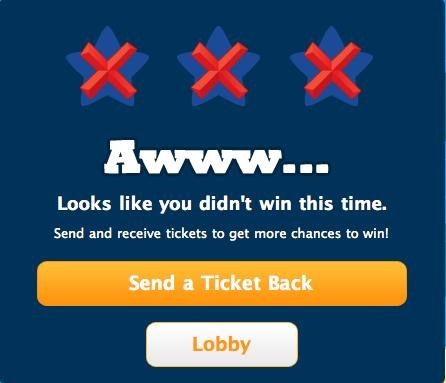 You can send a ticket back from this screen or go back to the lobby and send the ticket back from there. Sending a ticket back is a great way to thank your friends for clicking on your link. You can NOT collect another prize from the same game. To get the screen to go away and let you play another ticket, select a prize from another game. You do not need to go claim it at this time and can close the next popup. Don't worry, you can claim it later if you want to! Keep playing your tickets to try to get more stars to collect sets 1-4 for all the games! If you run out of tickets before you win them all, you can try again tomorrow. 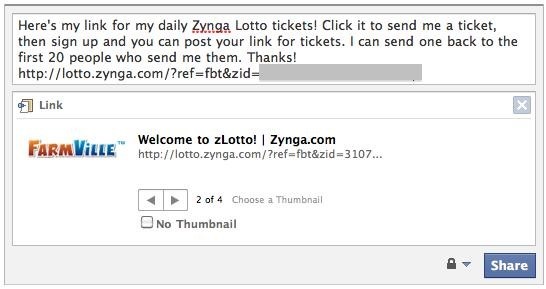 Instead of sending tickets through email, just post your link on Facebook and send tickets back to those who respond. This should get you through your daily 20 quickly and fairly. Make sure you come back daily for more tickets to try to win all of the prizes. You do NOT have to collect your items immediately. You can close the collect screen after you claim your prize and continue playing. Collect later by clicking on your game's tab and you will see the collect button under your prize (see images at the beginning of this article). 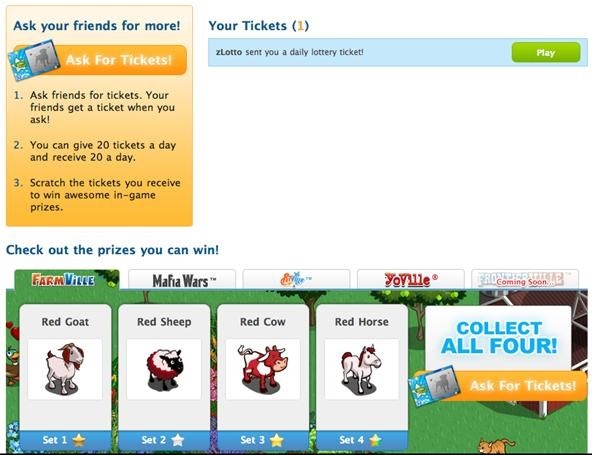 You can only play and send 20 tickets per day, so be sure to take that into account when you are sending tickets! Good luck! 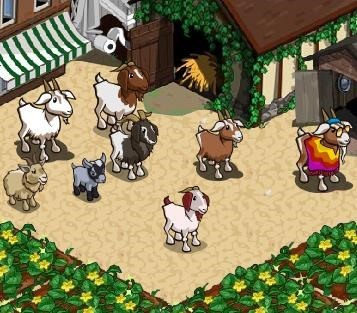 You can find more FarmVille How-To guides, game updates, and tips on FarmVille World. I earned the collection after 3 days and now play for my friends even though I can not collect any further items. I got the 3 little stones for Frontierville. cool!